The Madison Park Essentials Eden Complete Bed and Sheet Set is a bold and sophisticated update for your bedroom. The grey comforter showcases purple and dark grey floral leaves wafting gracefully toward the foot of the bed. On the reverse side, a solid purple adds a pop of color that beautifully matches with the bed skirt. The coordinating sham(s) and an embroidered decorative pillow accentuate the floral motif and give this complete bed set extra charm. A purple and white sheet set harmonizes beautifully with the rest of the ensemble, completing the look. As you can see from my photo, my walls are this beautiful shade of lavender, recently painted. This comforter set goes great. I love the soft material. I thought I wasn't going to like the coordinating sheets, but when you put it all together, it goes really well together. The comforter is much warmer than I thought it would be. I love this set. That's my Lucy in the photo, she just had to get in the photo. This set is pretty and elegant-just what I wanted for my pre-teen. The sheets are coordinated, not matchy-matchy, and 100% cotton for breathability. The comforter is polyester, which may be too hot for my warm-natured kid. The embroidered pillow is an extra classy touch. I bought a twin and a full set (for bunk beds), and both are true to size. Great price for a very nice and complete bedding set! Really awesome!! I'm sooo happy with this set!! You get a LOT for this price... sheets, bed skirt, shams, a small adorable pillow w same design! Fits into my purple themed bedroom perfectly. Weight of comforter is perfect! Love love love!! This Complete Bed &amp; Sheet Set makes my room look fabulous. 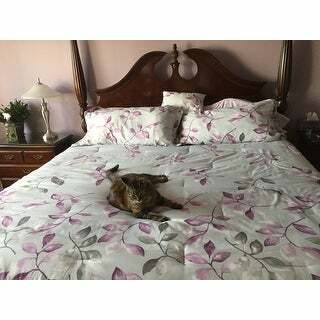 The bedding is pretty and comforter light weight but warm enough in the winter months. My only issue is the threading holding the filling in place, it's dark purple on the gray fabric. I thought this was a flaw so returned the first one and asked for a replacement. The second one was exactly the same. However, the threading is not at all noticeable when on the bed. Washes well and dries fluffy. I was pleasantly surprised at how soft and fluffy the comforter is! It appears to be very well made and the colors are beautiful! I also like the sheets and the pillow is pretty! My 2 cats also approved...they have been laying on it since I put it on the bed! Nice comforter, not to light or to heavy. Like it has matching sheets and pillow cases. It came exactly as pictured. The sheets are very comfortable. Colors match perfectly with curtains and other items in my room. The comforter is a perfect weight for me. Nice quality comforter set was a gift for eleven year old granddaughter’s bedroom. She is very happy with it. I am pleased with the quality. Nice to have sheets included. I liked this a great deal. The comforter is reversible which has a nice, solid purple on the reverse side. As usual, I mainly purchased this for the comforter, but the entire ensemble is very nice if you use a lot of throw pillows. The comforter did not hold up well from multiple washings. The batting balled up inside, but this is a common problem. I have to wash it a lot because I allow the cats to sleep on the bed with me. I have been shopping around for awhile for a new bedding set. I am very happy I purchased this from overstock. This set is perfect and goes well with my bedroom decor. Set looks just like in the pictures. Thanks overstock. Absolutely love this comforter set. It is so soft. I may actually purchase another one. You won't be disappointed with this purchase. Got this for my guest room and it looks so nice. The walls are gray and this color really brightens the room. I recently repainted a small bedroom a lilac color. Was having a little trouble finding a color to go with the new color. I wound up with silver/grey curtains and when I saw this comforter, I was thrilled! It goes perfectly- it’s well made, the comforter is soft and the bedskirt is a great addition. Nice fabric. well made . fast delivery. Good quality and beautiful. Exactly as in pictures. Love the comforter. It’s just the right weight and so soft. The purple color was the right shade. However the sheets were a really stiff. I’m hoping that after they’re washed a few more times, they’ll improve. The color was okay. I got this comforter set for my mom! It's beautiful, and she loves it! Very pleased! Bought this last year when we painted our bedroom two tone gray. Didn't need the dust ruffle so I made valances to go over my white curtains at my double window. The sheets are just a bit small but they fit. Can't wait for spring to put this set on again...so refreshing. LOVE this for my Purple bedroom! Just enough colors to be classy but not overdone. The sheets that come with this are very nice and soft (I didn't expect that!) Washes well and looks crisp. I bought this for my mother in law who lives with me. Her favorite color is purple and it fit her taste perfectly. The colors are nice and really true to the picture. It may look even better in person. "Can I only buy a set? I love the set but I always buy a king comforter with queen sheets...."
"Does this come with the bed skirt shown?" Yes,the bed skirt in the picture is included. "What is the thread ciunt?" The comforter and matching decorative pillows are made of polyester microfiber. Thus thread count does not apply. The sheet set included is 100% cotton sateen in 180 TC.